22 up, 22 down…The Kellenberg class of 2019 will finish their varsity careers having never tasted defeat as they repeat as NYCHSFL “AA” champions behind a 41-6 victory over Xavier. Getting their title defense bid off on an unusual but admittedly effective foot, Kellenberg would recover the opening kick-off on a Kyle Sharkey squib on the Xavier 36-yard line…On the ensuing play, it would be senior quarterback, Matt Sluka, doing what he does best, calling his own number on a QB draw and running the entire way into the end zone for the 36-yard TD to immediately put the Firebirds ahead on the board, 7-0…The 6’3, 205-pounder’s double-A leading 21st rushing touchdown of 2018, the red-headed assassin would just be getting his afternoon started as he would add three TDs in the air and another on the ground en route to being named the Outstanding Offensive Player of the Game for a second straight finals appearance…Dating back to last November, in two title games, he accumulated 11 total touchdowns (7 rushing, 4 passing). The Kellenberg lead would double to 14-0 on their next possession of the 1st quarter when the Blue & Gold followed-up a turnover on downs (Paul Taliercio pass break-up on 4th & 7) by Xavier when Sluka connected with fellow 12th grader/future U.S. Naval Academy student-athlete, Danny Wilson, on an 18-yard hook-up over the middle for the touchdown…Known more for his prowess on the other side of the ball, this was only the second catch of the year and the first TD scored by the reigning Defensive Player of the Year, Wilson….Prior to the touchdown strike, Sluka had a successful scramble on 3rd & 5 on his own 35 to preserve the drive. The 2015 champion, Knights, would get on the board with 7:45 remaining in the first half on a 12-yard touchdown carry by Anthony Bruno, but was unable to maintain their momentum as the “Berg” would re-establish their two-touchdown lead in the final moments of the second quarter on another Sluka TD trek…Already enjoying excellent field position after a Paul McGuinness fumble recovery off of a Jake Deakin (Defensive MVP) hit put them in Xavier territory, Sluka twice moved the chain on 3rd & 4 and 4th &1 situations before taking it to the promised land from 16-yards out to make the score 21-6 at the intermission. 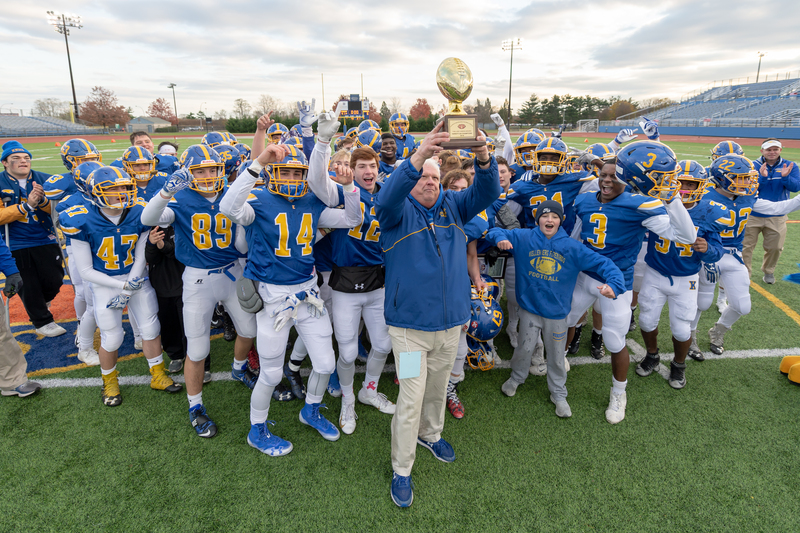 Picking up exactly where they left off, the Kevin Hanifan mentored Firebirds came out of the locker room on fire, putting touchdowns on the board on their first three possessions of the second half to record the only 20 points of the final 24 minutes of the Catholic season. Facing a 3rd &10 just across midfield with 7:52 remaining in the 3rd quarter, Sluka would find his favorite target, Matt Mongelli, on a 46-yard bomb to make the score 28-6…The TD grab was the ninth of the season for the 6’3, 176-pound WR who calls Flower Hill home. With the sun setting on what has been a magical journey for this Marianist senior class, Sluka would make sure to get one more name into the box score…Contributing the 70th and final TD of his decorated two-year career under center, #10 would roll out and put a beautiful rainbow pass over the shoulder of senior, Sean Boll, for another 46-yard strike…For Boll, who entered having caught just six balls in his swan song campaign, this reception was his 1st TD of the year. The outcome no longer in question, junior tailback, Jordan Delucia, would tack on a 57-yard touchdown run on the opening play of the 4th quarter to account for the final tally…The surefire successor to his field general as the focal point of the offense next season, the Bellmore native [Delucia] wraps up an incredible 11th grader year with 18 rushing touchdowns. He also was the yardage leader in the division with over 1,300 yards.